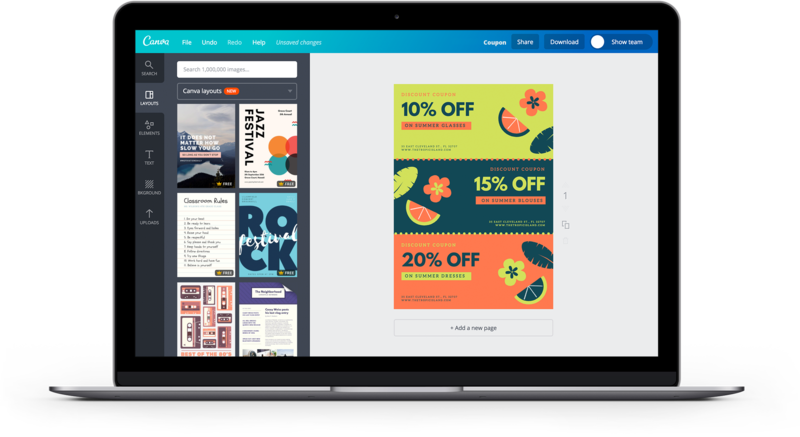 Entice new and existing customers with beautifully-designed coupons from Canva. Coupons aren’t just for deal hunters, they’re a great way of pulling in new customers, increasing foot traffic, enticing existing customers or just plain getting your name out. Small businesses and startups, in particular, can benefit from using coupons as a marketing tactic. Coupons, like any other branded material that carries your business name, should always be well-designed and eye-catching. If you feel intimidated by the thought of designing your own, fear no more, Canva’s design features were created with design newbies in mind. First, there’s no need to design from scratch because you’ve got professional, ready-made coupon templates and layouts to choose from. Second, our simple drag-and-drop tools make editing and customizing those templates a breeze. And, finally, printing and sharing your new coupon design will only take a few clicks. Design your coupon in 5 easy steps. Create a new Canva account to get started with your own coupon design. Edit a template and make it your own. Design beginners can relax because with Canva, you won’t have to design anything from scratch. Our team of amazing designers have created professional layouts and templates that you can use as your starting point. Once you’ve picked one that catches your eye or suits your needs, you can simply edit the text, recolor some elements, or move them around until you have the perfect coupon design. Canva is also flexible enough that you can create your coupon designs from scratch. With different tabs and tools to work with text, images and graphics as well as an amazing media library hosting over a million professional-quality photos and illustrations, you have everything you need to design all in one place. If you want to make your design more interesting, why not add a background or texture to your coupon? Adding this extra layer of detail can make a design more eye-catching or feel more premium. Canva’s media library contains thousands of abstract images, patterns, and textures to add to your design. Creating a coupon for a restaurant? We’ve got flat lay images of scrumptious food. Designing for a spa? We have nature images galore. Whatever industry you’re in, you’ll sure to find the perfect image for your business. Make sure your customers know exactly who’s treating them to these awesome deals by adding your brand assets to your design. You can upload your logo and use it in your coupon design by going to the Uploads tab, clicking the green ‘Upload your own images’ button and choosing from any JPEG, PNG or SVG file on your computer. Once uploaded, your logo (or any other photo you upload) will automatically be saved on your Uploads folder and can be used on all your next designs. Uploading and using your own images is absolutely free in Canva. All done? Then it’s time to get your coupons into the hands of your customers. Canva gives you several options: first, you can go old-school and print them out. Click the Download button then choose the PDF – Print option to ensure the best possible quality for print. Have them printed then hand them out. Second, click the Share button and choose whether to send your design via email or post it straight to your social media accounts to inform your fans and followers. Finally, you can choose to embed your design into your blog or website—perfect for ramping up engagement and traffic to your online store. Simply head on over to www.canva.com to start creating your coupons. You don’t need to download Canva, just create an account and log in. If you want to design on the go, add the Canva app to your iPhone, iPad or Android device. It’s free to download from both the App Store and Google Play.